Once the small Portage Creek drained Portage Lake. An enterprising mill owner, Mr. Stronach, placed a dam on this creek to help his lumber mill operation. Future mill owners would periodically raise the water level on the lake and flood the property of early homesteaders along the shores. Since these homesteaders were improving their land, they weren't very happy when lake levels were raised. Push came to shove and by 1871, a small ditch was dug to prevent the water level from being artificially raised. The original building was constructed in 1902 and opened as a summer retreat in 1903. 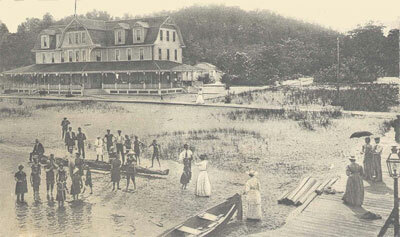 The resort was the vacation dream of many elite city dwellers from Chicago, Milwaukee and beyond, wanting to escape the pressures of city life.